Note: I have been a subscriber of Valuation Review and it’s predecessor for years. It provides a wide perspective on the appraisal industry and I’ve always got something out of it. Over the past few years, I’ve noticed that the voices in the magazine seemed to be skewing more and more towards national level AMC executives. I suspect the PR departments of these firms make their top executives readily accessible washing out the voices of individual appraisers. So I sent the editor a note offering another perspective with links to my content. He was immediately interested in getting another voice so he interviewed me. From the Wednesday, March 22, 2017, Valuation Review Article: CEO suggests appraisal industry comprised of ‘lone wolves’. Reasonable compensation, lender and AMC issues are constantly on the mind of the appraiser. When things aren’t falling into place, the process of assigning blame kicks into high gear with appraisers continuing to look for guidance. “That’s the problem in that there really isn’t any leadership for appraisers to follow. The false narrative of an appraisal shortage continues to be pushed by AMCs, unfairly tarnishing the image of individual appraisers,” Miller Samuel Inc. President and CEO Jonathan Miller told Valuation Review. “When an industry takes a 50 percent pay cut overnight, good people leave or struggle to hang on and weaker players are attracted-which equals problems. But is it the fault of the remaining individual appraisers? Like many in the appraisal profession, Miller strongly believes that there is not a shortage of appraisers. In fact, he more than challenges one reason for such a shortage is that too many burdensome regulations are being placed upon appraisers. “There is a shortage of appraisers willing to work for 50 cents on the dollar,” Miller said. “The AMC model has hit a wall. AMCs have run out of new people willing to work for 50 cents on the dollar. Sadly, consumers think appraisers are getting the appraisal fee stated in their mortgage documents. They aren’t and typically the appraiser receives as little as 50 percent of it. For the rest of the story, visit here. 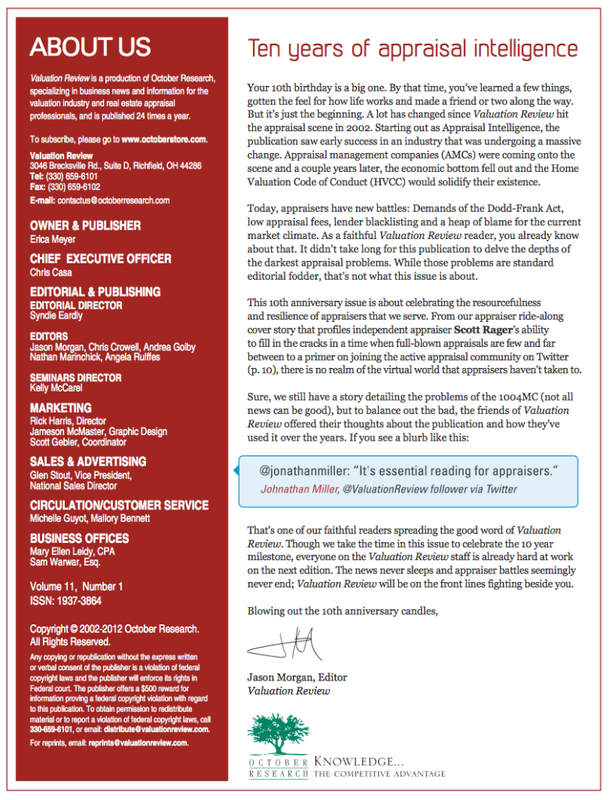 Here’s the Editor’s page in a recent copy of Valuation Review, an essential publication for real estate appraisers by October Research. I’ve been subscribing since nearly the beginning when it was called something else. Always relevant good reading for an industry besieged by bad information. And more importantly, take notice of my twitter shout-out . Fun!